A round cambric gown, a walking length, with short full sleeve, and puckered cuff, buttoned or laced down the back, and made high round the neck, with a full frill of lace. A military stock, edged round the chin with the same. A figured Chinese scarf, the colour American green, twisted round the figure in the style of antique drapery. Melon bonnet the same colour, striped, and trimmed to correspond with the scarf. Hair in irregular curls on the forehead. Earrings of gold or topaz. Long York tan, or Limerick gloves, above the elbow. Slippers of yellow Morocco. 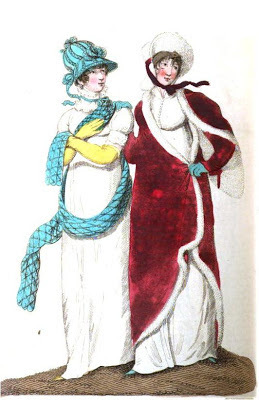 This dress, divested of the bonnet, is considered genteel neglige for any period of the day. A simple breakfast robe of Indian muslin, or cambric; with plain high collar, and long sleeve. Plain chemisette front, buttoned dawn the bosom. A Calypso wrap of morone velvet, or kerseymere, trimmed entirely round with white ermine, or swansdown. Spanish hanging-sleeve, suspended from the back, and falling over the left shoulder, terminating in a round point below the elbow. This ornament is lined throughout with skin the same as the trimming. A mountain hat of white imperial beaver, or fur, tied under the chin with a ribband the colour of the coat. Gloves and shots of American green, or buff. Cropt hair, confined with a band, and curled over the left eye.